Routing is a mechanism using algorithms to make sure that the connections don't cross each other while building links/paths between the shapes. 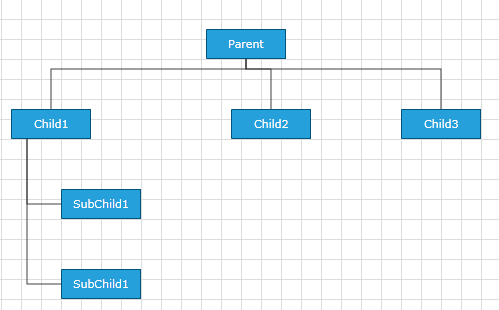 Routing in RadDiagram is only available if the RadDiagram.RouteConnections property is set to true. Please note that its default value is False and you need to explicitly declare you want to enable the routing features. A bigger value will decrease the time to compute the optimal path and will diminish the possible wiggling of the connection path due to obstacles (other shapes). On the other hand, a bigger value will not necessarily lead to an optimal solution in certain circumstances. That is, if your diagram involves a lot of shapes and a high complexity a bigger RoutingGridSize will not find a path through the maze of shapes. A smaller value will increase the time tom compute the optimal path and increase the set of possible solutions for the path constraints. On the other hand, a small value leads usually to a lot of stairs/wiggling in the connection's path. The IsConnectorsManipulationEnabled is set to false. The LayoutType is among the following 5 - TipOverTree, TreeDown, TreeUp, TreeLeft, TreeRight. The TreeLayoutType points to the type of Layout you wish to use. The routing logic is based on this LayoutType. The ConnectionOuterSpacing is the minimum margin between the Parent/Child Shape and the connection. 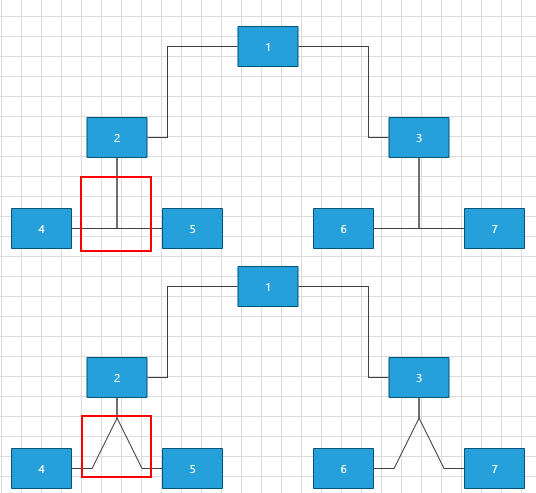 Below you can see these shapes after TreeDown Layout operation performed on the RadDiagram. When the TreeLayoutType is set to TipOverTree, the OrgTreeRouter uses a special kind of router - the TipOverTreeRouter. It produces best visual results when a custom connectors are added in the bottom-left part of the shapes. Here is a sample code snippet demonstrating how to create and configure TreeLayoutSettings and create and assign a Router to be the default one. 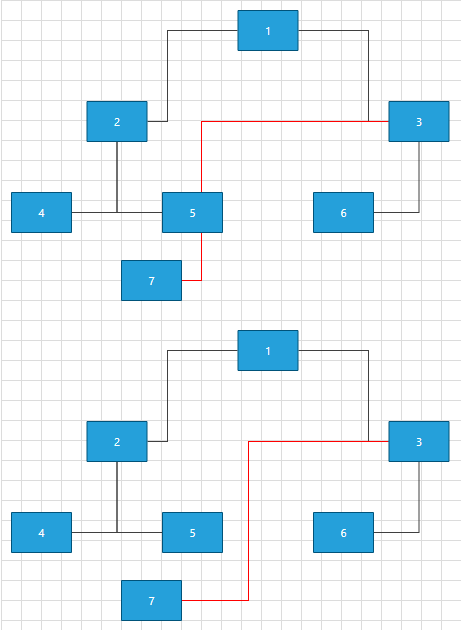 * DiagramConstants.RoutingGridSize - of type double and gets or sets the routing grid size. * DiagramConstants.RouterInflationValue - of type double and gets or sets the size of the restricted area around the shapes. * AvoidShapes - boolean property controlling the logic that makes the connections go around the shapes. This property is false by default. * WallOptimization- boolean property controlling router optimization logic. If you set this property to true the router will try to optimize some of the steps so that there are the least corners. The order in which the steps are returned is important - if you have two steps with the same price we'll choose the first one. * CalculateWallPenalty - this method calculates the penalty for the node that we give it. By default if the node is inside a shape we return the penaltyBaseValue which is the heuristic distance to the endpoint. * CalculateBendAlteration - this method calculates the bend alteration. By default the result value can be positive - a penalty for changing the direction or negative - a bonus for keeping the direction. If the source and target positions of your connections are Auto this router will adjust them so that the path is minimal. The InflatedRectRouter is a simple connection router whose goal is to create a route with least bends. This router doesn't try go around shapes except the start and end shape. In the following section we will create a custom Router. This way we will be able to set the routing points of our Polyline Connections. Please note that we only have to add in the list the route points, no need to add the start and the end point of the connection.